Ahh such a cute dress! You look gorgeous, Rory! Merry Christmas!! AGH RORY I really love this outfit!! BLACK AND WHITE AND PINK SO BOLD WHAT you look amazing. I seriously love that dress. Girl, you so stylin. Oooh! I'm so excited for Christmas, too. We usually open gifts on Christmas Eve and then open Santa gifts and stockings on Christmas Day. :D It's fun! And we also eat meatballs and mashed potatoes for dinner on Christmas Eve. Have a suuuuuuuper fabulous Christmas, Rory! STAY CHEERY AND AWESOME. 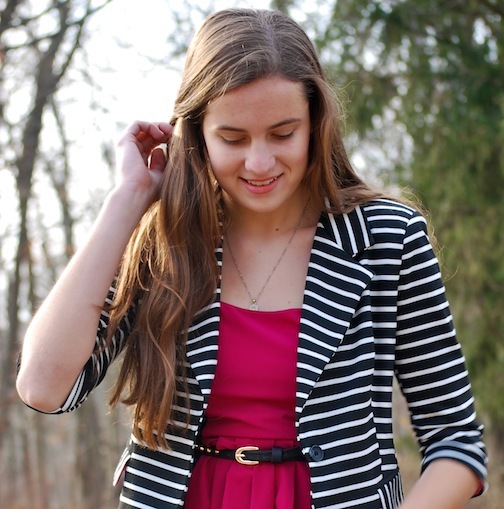 The color of the dress with the striped blazer is so perfect, loving this look! Love the dress you got from them, its so pretty. Can't wait to see what else you'll be styling!